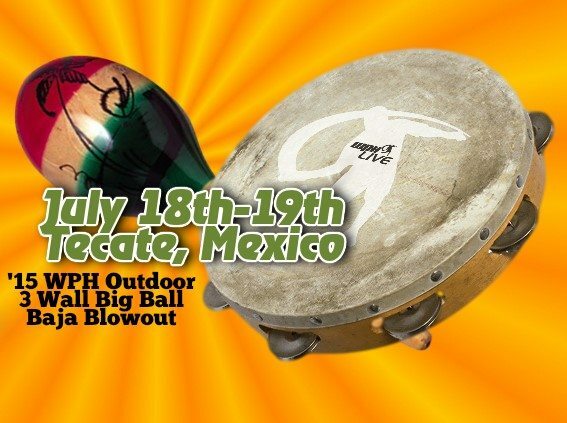 WPH heads south of the border for the third stop in the WPH Outdoor Big Ball 3 Wall Cup Series, July 18th-19th. Unidades Eufracio Santana, Tecate B.C Mexico- Over $3,000 (USD) in prize money dispersed over just three divisions as the biggest names south of the border go up against those from el norte. The WPH Outdoor Cup has seen Samzon Hernandez & Juan Santos dominate the scene; however, Ricardo Ruiz took down Mexico in a riveting final last year. Local super stars doubles Victor Martinez/ Jose Lopez of Tijuana (winners of last year), are ready to defend home court! WPH is offering A & B Doubles and A’ Singles with over $3,000 in prize money between the divisions. This event is capped at 75 total players- first come first serve. *Contact Tom Flores @ flores@wphlive.tv for more details (Rules, Entry, etc) – Sign up at r2sports.com. * This event is apart of the Hemborg Ford Cup.